This blog post won't score me any Brownie points with Prof. Ulichne (or most people) but there's an important religious issue that nobody is talking about and somebody needs to bring it up. should strike the fear of God into the heart of every Jew, Christian, or Muslim that sees it. By Biblical definition, it is absolutely, 100% a pagan idol of another diety. I won't even tell you the diety's name. You'll have to read the article to find out. Different religions have different ideas about what angers the Lord. In the church I grew up in, drinking caffeine made God mad. Lots of churches told me that caffeine was okay, but God gets mad if we drink alcohol or smoke cigarettes. I never read any of that in the Bible, but one thing I've read enough times that I can say with absolute certainty is that idolatry angers the Lord. See for yourself. Scroll down this page to get a general idea about how the God of the Jews, Christians, and Muslims feels about statues of other dieties, and what the consequences can be for displaying said statues for the adoration of others. "It is a precious treasure, an important archaeological discovery," said (Ahmed) Bursh. 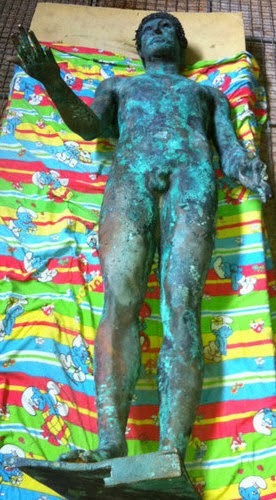 Once the statue was released by police, his ministry plans to repair it and put it on show in Gaza. "International institutions have also contacted us and have offered to help with the repair process," he said, adding that a museum in Geneva and the Louvre in Paris wanted to rent it. If you're an atheist or your religious beliefs are not Abrahamic, this is no doubt an incredible archeological find that should be celebrated by lovers of antiquity everywhere. But if your religious beliefs stem from Christianity, Judaism, or Islam, this is not just an artifact... it is in every way an idol. Prayers are always needed for the Holy Land, and anywhere else this abomination might happen to turn up. I find that idolatry is a more complicated issue than just merely worshipping a pagan artifact. Idolatry is in the terms of semantics, substituting the symbol for the thing. In this case, the thing being substituted is God. Many people confuse symbols for god. The cross can be an idol, the holy books can be idols, stained glass windows, etc. etc. This is a historic artifact, but we have no idea of the type of people who made or used this artifact. They may have been a good Godly people. We cannot or should not judge. A person who might devoutly perform all religious ceremonies, observe all holy days and feasts, make it to every church service and bow down in reverence to the alter dutifully yet thumb his/her nose at the homeless person outside the church door and feel no compassion or empathy for other human beings might just be as guilty of idolatry as any "pagan." "Do not turn to idols or make for yourselves any gods of cast metal: I am the Lord your God." --Leviticus 19:4. "It is a precious treasure, an important archaeological discovery..."
I think that says it all. Why should I be upset that somebody found something old and valuable? I don't have to worship it to realize the value.